Maggie passed away the other morning after a long, adventurous life. My father and mother took such good care of her in her last days and I cannot thank them enough. 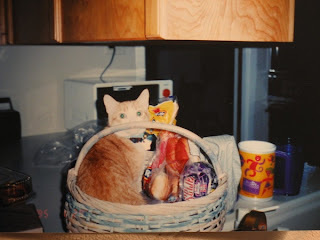 The picture is from years ago when Maggie used to sit in the bread basket on my parent's kitchen counter. She will be missed, but we are so happy she went peacefully and without pain. I love you orange kitty with six toes.